Princess Anorexia has been decked out in all her finest again. 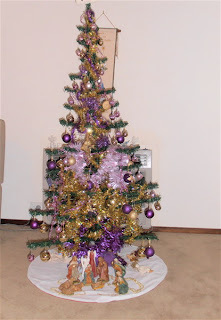 This year it is purple and gold-my favourite colour scheme. I haven't put any lights on the tree this year because last year we forgot to turn them on each night. Unlike you people on the other side of the world from us it doesn't get dark here until around 9.30pm because we are in our summer and it is also daylight savings as well. 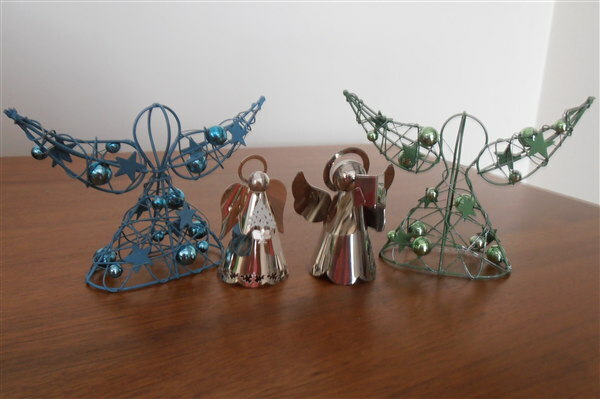 So I thought I would just save myself the bother of taking them down after Christmas. 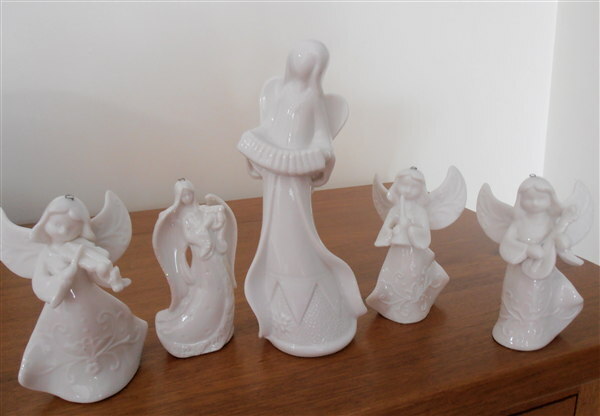 I also thought that I would show you my collection of angels-some I have made the other were bought. 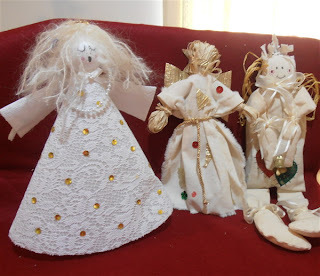 The two fluffy ones were a kit from the dollar shop about 7 years ago and the one in the middle was a gift from my daughter along time ago. 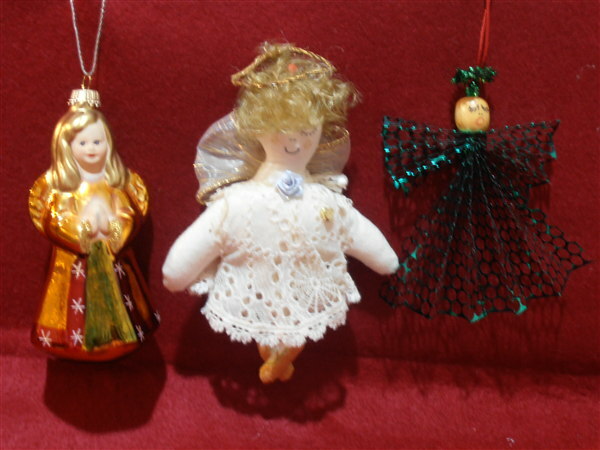 The one on the left was purchased in The Hague when my daughter was working there about 8 years ago. I purchased the middle one at a craft market about 10 years ago and the green one is made from sequin waste and I got it around the same time. And this trio were made by me probably 12-14 years ago. 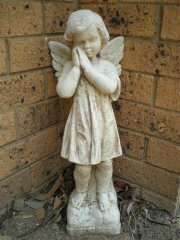 They all surface every year and sit or hang around the lounge room. I do have more but I didn't want to bore you to death. Your tree looks so beautiful Doreen it doesn't need any lights and I love your collection of angels. I might pinch your idea of putting the Nativity scene under the tree. We always seem to need shelf space or the top of the sideboard for other things and the mantelpiece is already spoken for. Like Heather I like your tree and agree it doesn't need lights. 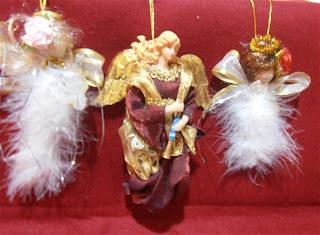 Your collection of angels has got me thinking I should look and find my few and put them together too. 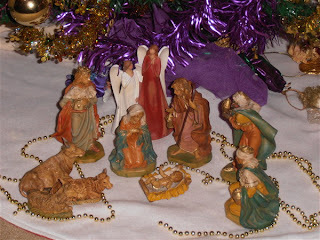 I love the thought of the Nativity scene under the Christmas tree. You may well be starting a tradition here. LOL! You just reminded me that I forgot to turn on the Christmas lights in our front windows tonight. And it is now 10.45 pm, so I'm not going to bother! It was suggested to me that we put them on a timer, but I'm not keen on leaving those kind of things to turn themselves on and off...they are at the front of the house, and if something went wrong we wouldn't know about it until half the house had burnt down. The tree shines anyway without any lights. Gorgeous colour scheme. Princess Anorexia looks great in purple and gold! I didn't think about the time thing with the lights. I knew you were having summer but just didn't think about the days being long at this time of year. It makes sense not to mess with lights on the tree if they're never on! Your angel collection is so pretty. 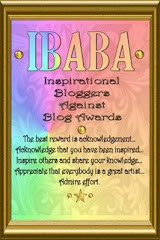 I especially like the ones you made and the ceramic ones. Definitely not boring to see your angel collection and I must say that I look forward to seeing the newest incarnation of Princess Anorexia - personally I don't think she's anorexic at all! !